Hawston was founded by Samson Gabriel Dyer60n 1859. It was named after Charles Haw and known as Haw's town. This historical fishing village has many stories to tell, one of whom is the abalone one. It was refuge and home to many from Ireland, Germany, France, Holland, USA, Sweden and England. Fully accredited local guides will take you to historical places as well as the mountain, harbour, lagoon, swimming pool and the blue flag beach. Traditional foods at restaurant by arrangement. Kleinmond share a fascinating history of the early Khoekhoe people being a safe haven for runaway slaves, pirates, whalers in 1900's and fisher folk. It was traditionally a resort for the farmers from Caledon and Elgin. It is now home to diverse cultures sandwiched between the ocean and high mountains. You will visit the Harold Porter national botanical garden, the African Penguin Colony at Stony Point, the old Waaigat Whaling Station, " Lek my gat" fishing harbour, an abalone tour and the live-fish bar and townships. Traditional meals by prior arrangement. Gansbaai is named after the Egyptian geese, home to many of them. Samson Dyers who lived on the Island that bears his name used it as a base to store his seal skins during 1807 to 1840. In 1881 Johannes Cornelis settled in Gansbaai to fish. Today you have many communities that are still divided along the racial lines with their different cultures. You will visit Klipgat Cave that dates from the Middle Stone Age and Late Stone age. Stanford cove where the passengers saved off the Birkenhead went to shore, Danger Point Light House, the Strandveld Museum, the harbours and differed communities. Traditional foods available by prior bookings only. Struisbaai was named after vogelstruise(ostriches) that roamed in the area. It is a historical fishing village and hosts 30 shipwrecks. The harbour was built in 1959. The tidal fish traps used by nomadic Khoisan are still in use. The local fisher folk were moved to Molshoop far from the harbour where the used to live. You will also visit the Southern-most tip at L'Agulhas, the oldest working lighthouse in SA, one of the seven wonders of the ancient world, the lighthouse museum, fish traps and some ships in the graveyard. Traditional meals by prior arrangement. Arniston is named after the troopship that sank with 372 souls in 1815. Also named Waenhuiskrans by early inhabitants for their belief that a wagon with its span of oxen can easily turn in it. The unchanged fishing village Kassiesbaai has been declared a national monument. The area is a living museum. You will also go to the Waenhuiskrans cave, the historical fish traps, Khoisan shell middens, the spot where the Arniston sank and the shipwreck,(Arniston). Traditional meals by prior arrangement. Elim was founded by German missionaries in 1824 and is inhabited only by Moravian church members. The name was chosen because of the fountains in the area, after the biblical oasis in Exodus 15:27. The church built in 1835 with its oldest working clock dating back to 1764 is the heart of this closely-knit community. The only monument in SA to commemorate the freeing of slaves in 1834 was erected in 1938 and subsequently many settled in Elim. You will also visit the Church, the cold-water stone mill, a walk in the Heer-se-bos , the old graveyard were German missionaries and slaves lie at rest, Elim huisie(1820), Slave monument, arts and crafts centre. Traditional meals by prior arrangement. Suurbraak lies at the foot of the majestic Tradouw Pass, established by the London Mission Society in 1812. Many of its original houses remain. The site was originally a settlement of the Tamaqua tribe of the Khoekhoe people and part of their ancient cattle trading routes. It was called Xairu (Paradise). The Anglican Church was built by the inhabitants in 1880. The village is known for the handmade wooden chairs with sea grass seats produced by the residents. You will also visit Swellendam, founded in 1745 by the Dutch East India Company, the Drostdy museum, Dutch Reform Church and the Tradouw Pass. Traditional meals at the Ou Wawiel restaurant by prior arrangement. Genadendal means Valley of Grace and was established in 1738 by George Schmidt sent by the United Brethren(Moravian Church) to preach the gospel to the Khoi. All buildings and the Church Square were declared national monuments in 1980. The first teachers training college(1838) hosts the National Cultural Treasure museum which forms the focus of the town. On the surrounding hillsides live the friendly townsfolk whose cottages tell its own stories. You will also visit the Boesmanskloof, Greyton, Voostekraal and Beria to give you a wholesome understanding of the present and the past as history unfolds. Traditional meals available by prior arrangement. Zwelihle means place of beauty. The township came into being in 1962 to house blacks who were forcibly evicted by the former government. Most of the residents are of the poor working class. Observe the sense of pride in their heritage and ability to cope with adversity. These cultural tours present an opportunity for tourist to gain an insight into township life and experience "UBUNTU", the traditional African hospitality. ou will visit the men's hostel, traditional healers, a shebeen(township bar), handcrafts training centre and more. 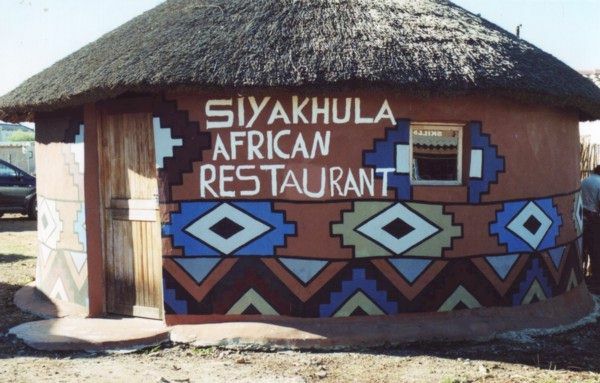 You will also visit the SIYAKHULA African restaurant and by prior arrangement taste the rich flavours of traditional dishes.